Hello lovelies! Today I would love to introduce to you a new series I am working on for Pretty Southern called Decorating With. It will be a guide to decorating with a certain item, trend, color, or idea each week. This week I want to introduce the idea of decorating with Vintage Letters. This is something that has been somewhat trendy in the decorating world but has not gotten to the point of being overdone or too much. M y husband and I are constantly on the lookout for unique, old, wood or metal letters; but you certainly don’t have to be a designer or type junkie to love this idea. It is a great, one-of-a-kind way to personalize a space, whether it be a child’s room or a modern kitchen. 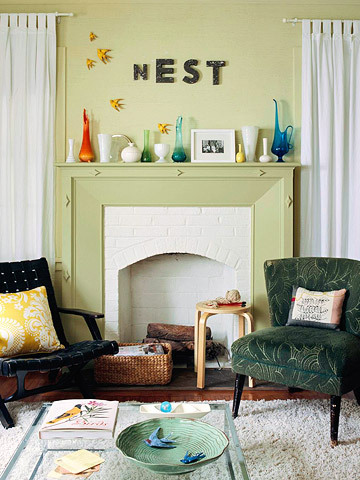 Use a random collection to spell out a name or add a moniker or personal mantra to your favorite room. While this might not be an original decorating idea, it will most definitely be personal to you and your combination of letters will be completely unique to your space and arrangement. So where do you find your very own vintage letters? While some big chain home design stores may have jumped on this idea and began producin g their own “vintage” style letters- they are sure to be overpriced and less special than that one of a kind treasure you will be seeking out. My top choices for searching for authentic vintage letters are online sources, flea markets, and architectural salvage stores. Online sites like etsy.com, ebay, or amazon have great, already curated finds that would make it easy for you to seek out specific letters when trying to spell out a name, quote, or initials. If you are not hunting for a specific set of letters then you may have more fun trying your luck at a flea market or an architectural salvage store. These may take more hunting, but that’s half the fun of decorating, and a bit of elbow grease to get your letters into display-worthy shape- but you can finds tons of treasures for cheap at places like this! So take a look around your house and see if there is a room that could use a little sprucing up or personalization. 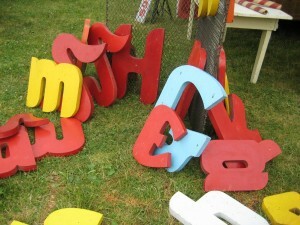 How sweet would it be to spell out your baby’s name in a found collection of classic letters? Or to put together as a lovely gift for a friend moving into their first home? So the next time you are out thrifting or flea market hunting be on the lookout for your next decorating treasure! image sources: image 1, image 2, image 3, featured image.